Belonging to the Augustinian priory of St Mary, Guisborough, this collection of theological writings and sermons would have been read as part of the daily programme of Bible study undertaken by the monks. It would have been a scholar's book, with very little in the way of decoration. Much of this volume is taken up with the writing of Alcuin, the late 7th-century Anglo-Saxon monk who was headhunted by Charlemagne for his reform of religion and letters. 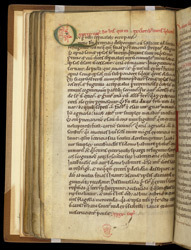 This page is from Alcuin's work which is called the 'Speculum', or 'Mirror.' Chapter 39, with its title written in red, begins with a modestly decorated first letter, typical of work-a-day scholar's books produced at monasteries.